If you're looking to buy a big-sized grill, to conduct fascinated occasions at your home and to feed the best to your guest, don't worry; we'll be showing the affordable option to you. In this article, we will be analyzing one of the most affordable gas grills on the market which is Dyna Glo 5 burner grill which may be suitable for you if you are tight on budget. The Dyna Glo 5 burner grill consists of iron cooking grates that are coated with porcelain enamel. The advantage of porcelain enamel is that it won't allow food to stick over the grill. Due to this, it becomes easy for user's to clean and maintain it. Moreover, porcelain enamel ensures even distribution of heat all around the grill for effective cooking. Thanks to its doubled-layered hood that retains heat when it is closed. At the top of the hood, there's a built-in-thermometer that displays the temperature inside the grill. On the lower side, there are two doors made of stainless steel under which you can store crockery, bread or whatever you want to. Most of the grills are made of low quality steel to keep the price down, but this model had premium quality stainless steel which is a big fact. 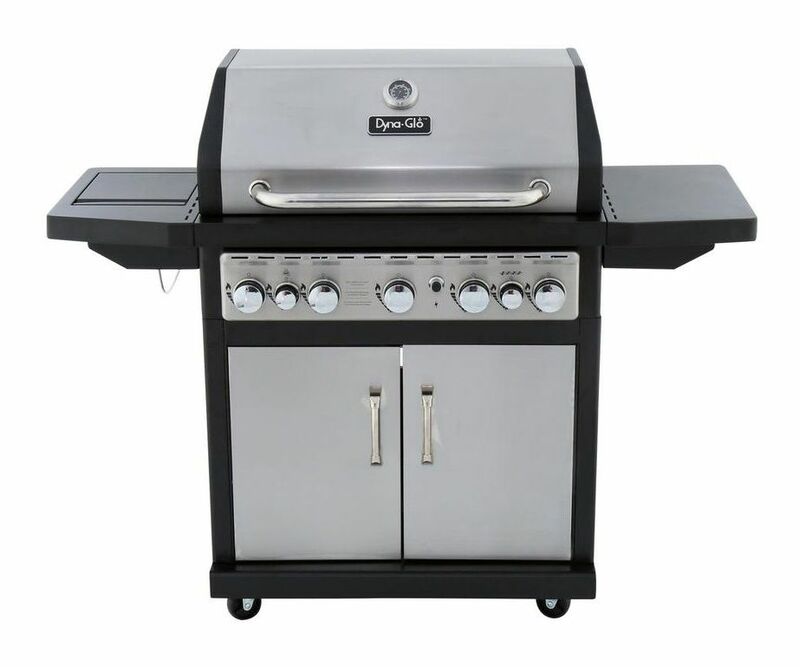 This grill is controlled by chrome-plated dials located at the front panel. The main feature of this grill is its grilling space. User's get plenty of grilling space area which is sufficient for five burners. 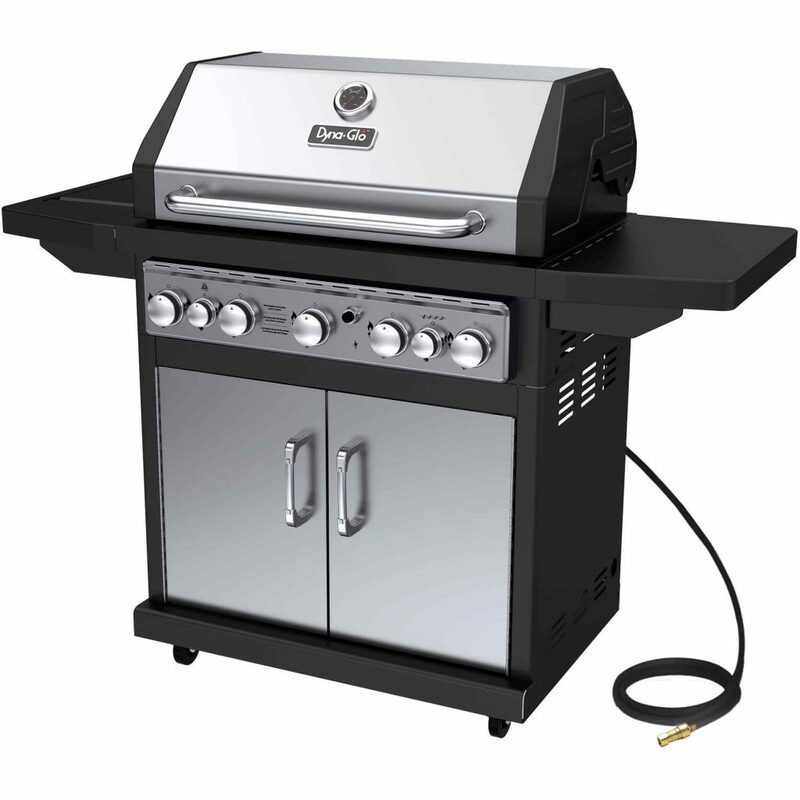 Moreover, it comes with side burner of 12,000 BTU and also an infrared rotisserie burner of 12,000 BTU. So you can even grill the whole of chickens on rotatory spin. We would like to clear the fact that it only includes rotisserie burner as standard, not the rotisserie kit. Users have to purchase the motorized rotisserie kit on their own. 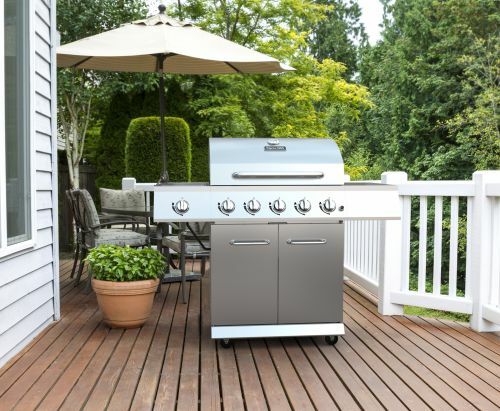 Well before making the final call for purchasing an electric grill, we recommend the buyers to look for a grill that comes with a side burner. They are separated from the central cooking area so they can be heated up gradually. Moreover, they are handy while cooking sauces and other things, as this advantages for the best utilization of time. Buyer's get an option to opt-in between two models, called natural gas model and liquid propane model. The natural gas model comes with a 10-foot long hose. While the liquid propane model won't have an option of the natural gas conversion kit. Talking more about the unit, it has a total of 550 sq. Inches of the main cooking area. But, if you'll consider the side burner and rotisserie burner, then the combined area gets raised to 764 sq. Inches. Practically, you can cook about 28 burgers in such a larger area. Overall, it's quite a large grill at such an affordable price. Nowadays, there are two types of burners available in the market, called conventional grills and infrared grills. While Dyna Glo 5 burner grill comes with conventional grills. It has total five burners that deliver the heat output of 55,000 BTU. Our recommendation is traditional grills as infrared grills heat up gradually and heat is more intense, which is a minus point. It has a large cooking area with side burners. It delivers the right amount of heat output of this size. The sliding tray makes it easy to install the propane tank. Some of the internal components are too lightweight. There's a significant gap in between grates. If we talk about the warranty of the product the company assures you a one-year limited warranty on the gas grill on the product. It also offers five-year limited warranty over the stainless steel burners. The replacement or repair will be valid over defective or broken parts at the time of purchase.